Review Result of 2018 Batch has been published. Backlog result of 2014-18 batch has been published. Backlog result of 2017 passout are now published. The Academic Council Meeting will be held in the Conference Room at 11:00 AM on 9th August, 2018. The provisional certificates and hardcopy of 8th semester marksheets are now available. DGPA Based on Data as on 26th July 2018. In case of any discrepancy please contact the Controller of Examinations. 8th Semester results of every department is published. ADMISSION DOCUMENTS for Lateral 2018. ADMISSION DOCUMENTS for M.TECH 2018. This is to inform all interested that submission of application for the SRF position in the Department of Civil Engineering, JGEC, is extended up to 23rd July, 2018 (23/07/2018), 5:00 pm. Interested candidates are request to go through the earlier advertisement for application format and other details. Syllabus for B.Tech 1st Year 2018 session. DOCUMENTS for ADMISSION of B.TECH 2018 Batch. Advertisement for the Post of SRF in Department of Civil Engineering sponsored by DHESTB,Govt. of West Bengal. Advertisement for the Post of JRF in Department of Mechanical Engineering sponsored by DHESTB, Govt. of West Bengal. The Results of M.Tech 1st,3rd Semester and Backlog results are published. The odd semester results of all the batches are published. Even Semester Backlog List of all departments and batches. Routine for Even Semester 2018 session. 4th Semester Form fillup date has been updated. Even Semester Examination Form fill up dates has been updated. Backlog result of odd semester examination 2017 except backlog result of ME 5th Semester of 2014 batch has been published. Even Semester Backlog Examination Form. The result of 7th semester civil has been uploaded. All students, teaching and non-teaching members of the college are requested to maintain peace and cooperate in leaving out the unfortunate impasse we had to face. List of Holidays of Academic Session 2018. Backlog Results of Even Semester is now available. Routine of Odd Semester 2017 is now published. Notice for Examination Form Fill up 2017. Registrations of the Seminar on Introduction to Version Control System are now open. JGEC Cognitive VIPNET Club affiliated under Vigyan Prasar (an autonomous institute under Department of Science and Technology, Government of India) started. Please find the attachment for the notification & forms with other details for the decentralized admission of Lateral Entry'2017 to be held on 23.09.17. Registration Notice of M.Tech Lateral Students 2017. Registration Notice of B.Tech 1st year Students 2017. The results of M.Tech Mechanical fourth semester is published. The sixth semester result of Civil Engineering Department has been published. 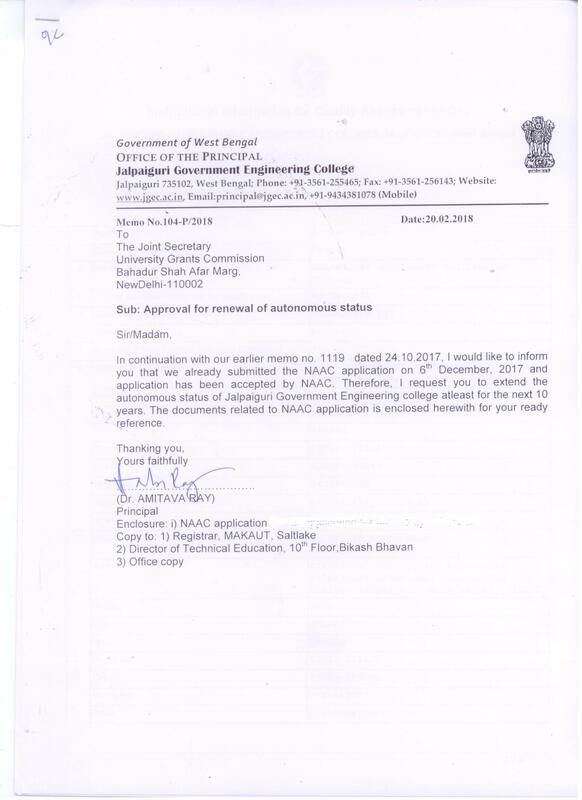 Notification for Re- De-centralized Admission Notification, 2017 for M. Tech. NOTIFICATION FOR DIRECT ADMISSION IN M.TECH'2017. 6th Semester results are out for every department other than Civil Engineering. Routine for special examination 2017. Notice for special examination 2017. De-centralised Admission details of BTech students of batch 2017.
Review results of back and re-backlog of pass-out students 2017 are now published. M.TECH ADMISSION DETAILS 2017. Interested students are suggested to download the notice. Hostel Allotment List for First Year Students 2017. LATERAL ADMISSION DETAILS 2017. Interested students are requested to download the form. All students having difficulties about accommodation during convocation time is suggested to contact the following persons as per your convenience. All Faculty and Alumni are hereby cordially invited to participate in the First Convocation ceremony. The results of 8th semester has been published. Automobile Course advertisement June 2017. Four Weeks Certificate Course in AUTOCAD organized by Mechanical Engg. Dept. Notice for Inviting Quotation of Information Technology Dept. Notice for Inviting Quotation of Electrical Engineering Dept. Notice for Inviting Quotation of Electronics & Communication Engineering Dept. Notice for Inviting Quotation of Civil Engineering Dept. Tender Opening Notice of NIT no.:JGEC/PU/162(Sanc. )/ST/P/S&T/6G-09/2017 Dated 04.12.2018"
Bid Document of NIQ No. 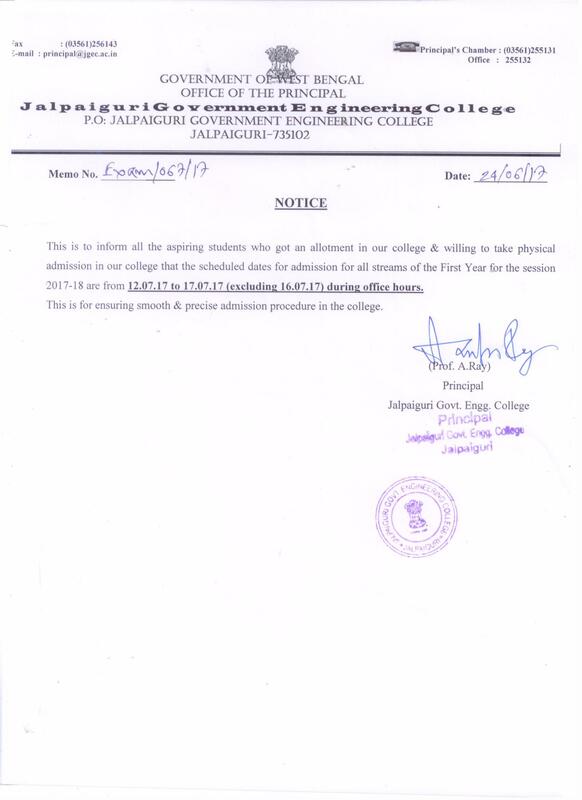 : JGEC/CPC/MEDICINE/2018-19/02 for Supply of Medicine for Collegiate Health Centre (2018-2019) of Jalpaiguri Government Engineering College, Jalpaiguri-735102. NIT No. JGEC/CPC/EXAM-STATIONARY/2018/01	Date: 15-03-2018 for supply of Stationary & Other General Items (Even Semester Examination 2018) for Jalpaiguri Govt. Engg. College, Jalpaiguri- 735102.